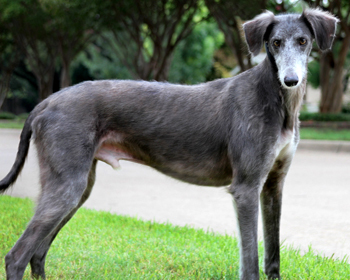 Charlie is one of 9 greyhounds GALT received from a Fort Worth Animal Control cruelty case. 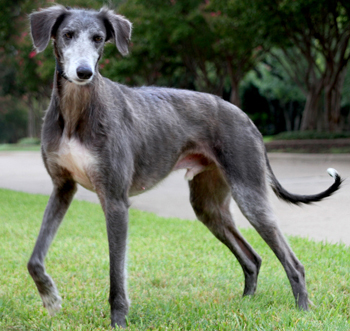 He is a spunky, approximately 2-year-old grey boy. Charlie was sweet right from the start - he is truly a "Wal-Mart greeter" type of a boy. 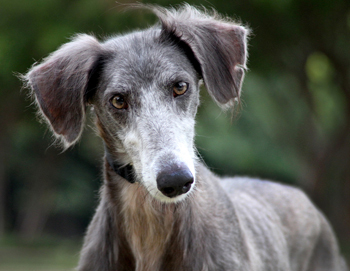 Just like the other rescued dogs, he arrived positive to babesia as well as ehrlichia. After extensive treatment, Charlie has tested PCR (polymerase chain reaction) negative to all tick borne diseases. He is also heartworm negative at this time. In September a tumor was found in Charlie's right ear canal, which was removed October 1 by Dr. Greg Arnold of the Dallas Veterinary Surgical Center. The mass in his ear dictated a total right ear canal ablation. Results showed it was a low grade malignant ceruminous gland adenocarcinoma. Dr. Arnold stated that the tumor excision was complete, and the surgery was curative. As a result he has completed all of his medical procedures and is ready to find his forever home! Charlie is not cat or small animal tolerant. Charlie is a sweet, mellow boy who loves to lounge around the house. He can often be found sleeping on his back, legs stretched out in abandon. He crates well and likes to sleep near our bed at night. He's got a healthy appetite, and loves treats. He likes riding in the car and will jump in eagerly. Charlie adores his walks, and likes to explore the neighborhood. He is quite good inside the house, and has excellent manners. This affectionate boy is very responsive to gentle correction. Charlie wants to be part of things if we have guests - he loves to say hello, but doesn't jump up on folks. We love Charlie, and think you will too!